Why do we keep returning to ideas that have been proven not to work? Education policy, like so many areas of lawmaking, is rife with reform proposals that, while attractive on paper, are supported by little or no evidence. Some are even proven failures. Yet once a lawmaker becomes fixated on a proposal, it seems that no amount of evidence will dampen that pursuit, and recent years have provided no shortage of evidence-free fixations: charter schools, cyberschools, private school vouchers, teacher merit pay, evaluation of teachers based on students' test scores and -- most recently and most persistently -- grade retention policies that require students to repeat a year in school. Let's look at grade retention. States across the U.S. are adopting mandates requiring that third graders with low reading scores repeat the grade. But retaining students is not a new idea. It's an experiment that has been tried on and off for generations, and it's been studied for almost that long. The overarching message from research in this area is that retaining a low-scoring third grader will not help her do better than a similar classmate with similar scores who is moved along to fourth grade -- but she will be more likely to eventually drop out. She may complete high school, at a cost of an extra year of school -- about $10,000. If retention had a substantial payoff, paying for an extra year of school would be worthwhile (although it nationally adds up to billions of dollars each year). But there's no benefit. With grade retention, we are paying more and getting a worse outcome. That's the evidence. It's what we have learned (or should have learned) from decades of experience. Grade retention can be expected to have the same destructive results in 2012 as it did when it was tried 10 or 20 or 40 years ago -- or any of the years in between. Yet our lawmakers do the same thing over and over again, each time expecting different results. To be clear, "social promotion" -- the movement of students from grade to grade with no meaningful intervention for those who fall behind -- is also not the answer. Instead, as proven approaches to address the problem of early reading gaps, research supports high-quality early childhood education, intensive early reading interventions, and smaller class sizes in early grades for at-risk students. Evidence supports grade promotion combined with these sorts of interventions, and it clearly cautions against a systemic use of grade retention, even retention combined with additional academic support. A reckless disregard of such evidence is harmful. It leads to the waste of precious resources: our tax dollars and our children themselves. The debate surrounding grade retention is only one example of the larger problem of policymakers ignoring the evidence. The U.S. achievement gap between rich and poor students, which is among the largest in the world, is the foreseeable and inevitable result of the corresponding gap in opportunities to learn. Disadvantaged children are confronted with obstacle after obstacle, from segregated housing and concentrated poverty to crumbling schools and inexperienced teachers, from hunger and inadequate health care to low-track, dead-end classes. These opportunity gaps will not be closed by lawmakers who reach for the quick fix -- policies like grade retention that are enticing and easily marketed but that are ultimately worthless. Rather, progress will follow from policies that promote deep, systemic, long-term changes in a system that shortchanges children in so many ways. So what makes lawmakers persist in enacting these detrimental policies in spite of the evidence? Are there lessons here for lawmakers? Do they think they can outsmart past experience? 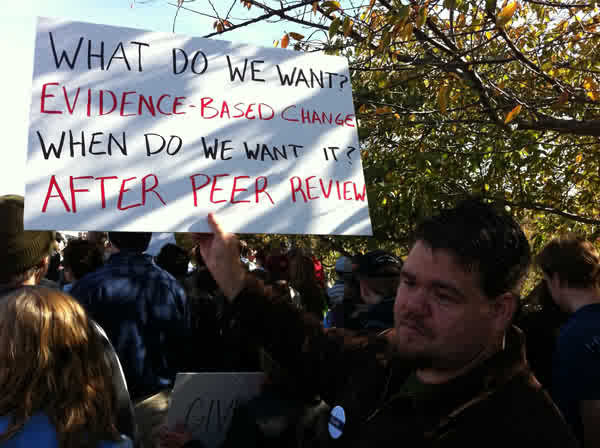 I'm reminded of a sign held up at Jon Stewart's 2010 Rally to Restore Sanity: "What do we want? Evidence-based change. When do we want it? After peer review." While peer review is neither a precondition nor a guarantee of sound evidence, it does represent a process that forces attention on the quality of evidence. And that's the trick: to change the dynamic so that weak yet alluring policy choices become less attractive, while evidence-supported policies become more attractive. This can only be accomplished by changing the nature and content of our nation's policy discussions. Yet in writing this, I'm wondering if I'm also like the very lawmakers I chide, in that I think -- in spite of years of evidence -- that it's reasonable to expect us as a nation to change the way we think and the way we make decisions. Nonetheless, I do hold out hope that we will change, perhaps because the alternative is so unpalatable: continued diversion of effort and money to dead-end policies when so much evidence exists to point lawmakers toward best practices. Children learn when they are engaged. They learn when they are challenged and supported in safe, nurturing environments. They learn when their teachers are prepared and are also supported, so that they can provide an education that is stimulating and rigorous. Today's gimmicky fads, like grade retention or like the high-stakes evaluations of teachers, principals and schools based on students' test scores, consistently fail to provide this kind of engagement. There are no miracle cures or magic beans in education. If we increase opportunities to learn, the result will be more learning. And if we deny opportunities to learn, the result will be equally predictable. Kevin Welner is professor of education and director of the National Education Policy Center at the University of Colorado Boulder School of Education.